Full disclosure: Diana Abu-Jaber is a friend. This is both very cool -- Diana is a smart, kind, generous person as well as an excellent writer -- and kind of fraught. Because when a friend publishes a book and you think, "Gee I should really read that," there's always that lurking fear: What if I don't like it? I shouldn't have worried. First of all, like I said, Diana's an excellent writer. 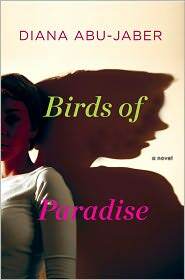 And Birds of Paradise started getting great notices months before it was published, in trades I keep an eye on (Library Journal and Booklist, the ALA's book review magazine). When it was published, last month, the great reviews hit the streets. So last week, I summoned the courage to read it. And it is great. Really great. Quick plot synopsis: The Muir family of Coral Gables has fractured. Felice, their younger child, has run away from home at 13 and had only rare, sporadic contact in the five years since. She's survived on the streets of Miami Beach by modeling and forming bonds with other street kids. Their son, Stanley, is semi-estranged, struggling to make a go of his organic market in Homestead. Dad Brian is corporate counsel to a developer that is a prime player in the mid 2000s building boom. The novel's main action takes place in August 2005, just before Hurricane Katrina sweeps across South Florida. Avis is a pastry chef who is in an extended state of shock from losing her daughter and somehow unable to connect with her son, despite their shared love for providing food as a vocation. The book rotates through the points of view of everyone in the family, though Stanley is mostly offstage until the book's finale. This works very well and somehow everyone is (mostly) sympathetic -- I was a bit fed up with Avis, at times, especially in her treatment of Stanley. But I was still caught up, wanting to know what would happen next. A couple things I particularly appreciated about this book. 1) The characters are real people, not merely metaphors who stand for some national trait or cardboard cutouts illustrating something about society. This, I realized as I was reading the book, is what irritates me in novels that are often held up as Great Literary Works (Don Delillo, anyone?). 2) She gets South Florida right -- you'd expect that, since she lives here, but it's still a pleasure and a relief since this is an area that so many people write about, many of them with only a glancing knowledge of the place. My favorite line from the book: "Increasingly Brian feels that living in Florida is an act of both rebellion and willful perversity -- like rebuilding a house on the train tracks." 3) Characters of varying ethnicities are real people, not merely foils against whom the Anglos to test out their wild and crazy sides. That's another thing that seems to happen a lot in Great Literary Works, especially by white guys. 4) She uses food in a truly literary way, as an expression of character and individuality, not as some gimmick or plot frame. Diana was a panelist at the first session of the Key West Literary Seminar, way back in January, when our topic was food in literature. She was a hit there -- I hope some of the folks who saw her there are reading (and buying!) the book.